Last week, New York City (NYC) officials issued a health advisory, calling on physicians in the city to be on the alert for patients with tick-borne diseases, as the number of cases continues to rise. 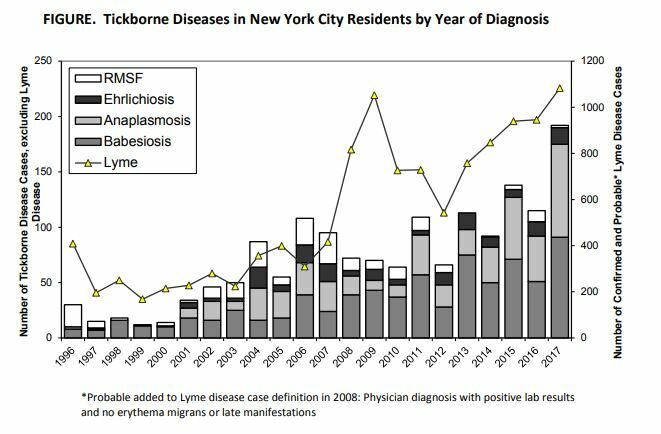 Since 2000, the number of tick-borne disease cases in NYC has steadily increased, with fluctuations from year to year. But between 2016 and 2017, cases of anaplasmosis and babesiosis more than doubled in all boroughs except Queens. And last year, the first case of anaplasmosis transmitted through a blood transfusion was reported in NYC. The authors discuss the case of a 66-year-old man who was admitted to a hospital in the South Bronx for presumed sepsis. The man had a history of hypertension, insulin-dependent diabetes, hyperlipidemia, and chronic kidney disease. His symptoms included dyspnea and weakness. He also had chronic swelling of his bilateral lower extremities. He had a fever of 100.76°F; a respiratory rate of 18; a grade two systolic ejection murmur, and +2 pitting edema bilaterally without calf tenderness. His laboratory tests revealed a mild anemia, mild transaminitis (AST and ALT), and thrombocytopenia. “He was persistently febrile on the medical floor with a maximum temperature of up to 39.4°C despite treatment with broad spectrum antibiotics,” writes Hajicharalambous and colleagues from Saint Barnabas Hospital Health System, Bronx, New York. On day 2, his condition worsened. His hemoglobin dropped significantly from 10.3 gm/dL to 6.0 gm/dL. His renal function worsened to a Cr of 10.4 milligrams per deciliter. His thrombocytopenia dropped from 88,000 per microliter to 66,000 per microliter. His transaminitis rose slightly. He was hemolysing with a reticulocytes of 2.7% and a lactate dehydrogenase of 631 IU/L. The man was transferred to an intensive care unit step-down unit for close monitoring and further testing. A blood smear showed intraerythrocytic parasites typically seen in babesiosis. “Upon further questioning, the patient stated that three weeks prior he had been at a local state park for a day trip,” writes Hajicharalambous. But he did not recall a tick bite. Hajicharalambous C, Rattu M, Leuchten S. A Walk in the Park: A Case of Babesiosis in the South Bronx. Clin Pract Cases Emerg Med. 2018;2(1):61-63. 2 Replies to "Babesia case in the South Bronx"
Could stem cell therapy rectify babesiosis infections? Also is it possible to determine which specie of babesiosis might be inflicting a patient if they have extensive travel history to multiple countries, numerous states and also regions/counties within 1 to 5 hrs drive of their main residence? There are plenty of unanswered questions.